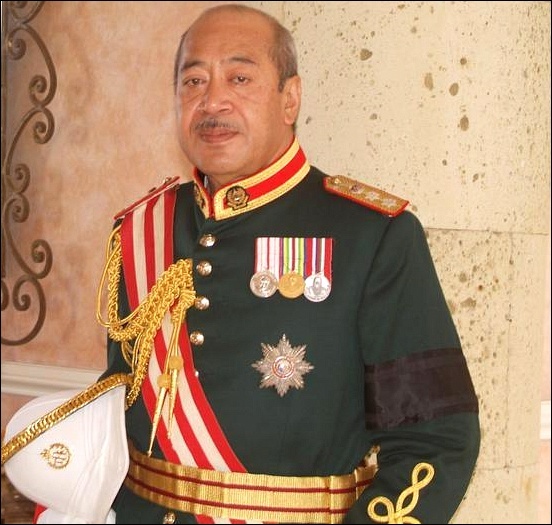 George Tupou V (Tongan: Siaosi Tupou, full name: Siaosi Tāufaʻāhau Manumataongo Tukuʻaho Tupou; 4 May 1948 – 18 March 2012) was the King of Tonga following the death of his father, Tāufaʻāhau Tupou IV in 2006, until his own death six years later. Tupou V was born on 4 May 1948. He was the eldest son of King Tāufaʻāhau Tupou IV (1918–2006) and Queen Halaevalu Mataʻaho ʻAhomeʻe (born 1926). '. Tupou V attended King's School and King's College, both in Auckland. This was followed by periods at The Leys School in Cambridge, and another school in Switzerland. He also studied at Oxford University and the Royal Military Academy Sandhurst in England. In 1974, though unmarried, Tupou V had a daughter, 'Ilima Lei Fifita Tohi. In 1997 she married police officer Tulutulumafua i'Olotele Kalaniuvalu, and has three children. According to the Constitution of Tonga, ʻIlima is ineligible to accede to the throne as only children born of a royal marriage may succeed. The King was recognised as a descendant of the sky god Tangaloa. 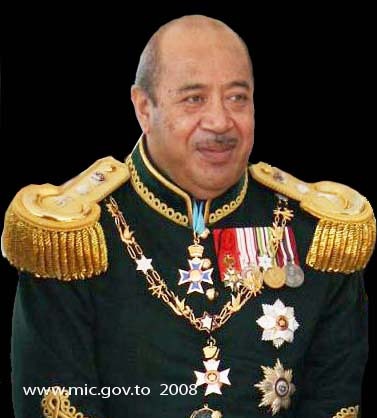 He was sworn in as King Tupou V on 11 September 2006, which also made him, from a traditional viewpoint, the 23rd Tuʻi Kanokupolu (the overlords of Tongatapu). The ceremonial aspects of Tupou V's accession took place in July and August 2008. These were initially to be held in 2007 after the six-month official mourning period for his father (as required of close relatives) and his own birthday. They were also deferred after the 2006 Tonga riots as he decided to focus instead on reconstruction of the damaged capital. Later that night, schoolchildren held 30,000 torches to proclaim the coronation in what is known as a tupakapakanava. The traditional torch spectacle was held that time at a spot overlooking the Pacific and is an ancient honour reserved solely for the Tongan sovereign and Royal Family. A second, European-style coronation ceremony took place on 1 August 2008 in the Centennial Chapel, Nuku’alofa. Anglican Archbishop of Polynesia Jabez Bryce invested George Tupou V with the Tongan regalia: the ring, sceptre and sword. In the culmination of the ceremony, Archbishop Bryce placed the Tongan Crown on the monarch's head. Royalty and nobility from around the world were in attendance. A documentary dated June 2004 by Australian journalist Gillian Bradford identifies some of the challenges facing Tongan society, but also shows that King George was in favour of a gradual transition to more extensive democracy in Tonga. In the interview, the Crown Prince, as he then was, points out that free speech in Tonga was protected by the Constitution. 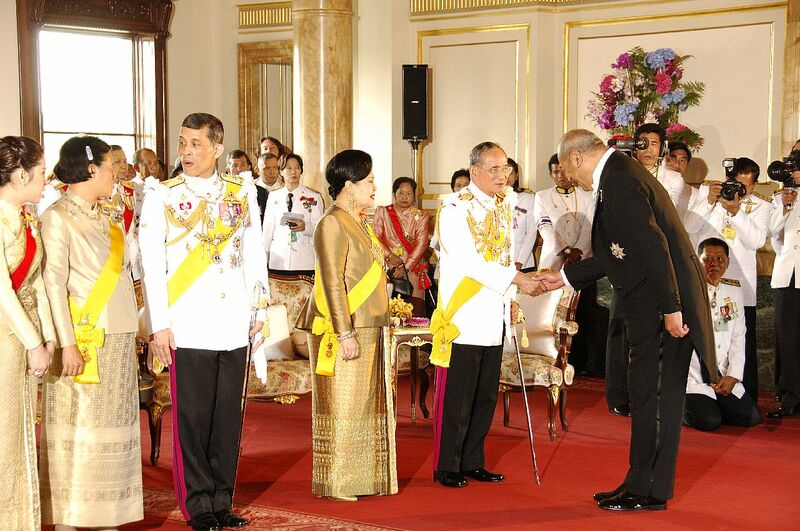 Three days before his coronation on 1 August 2008, the King announced that he would relinquish most of his power and be guided by his Prime Minister's recommendations on most matters. The Prime Minister would also be in charge of day-to-day affairs. Tupou V would still have the powers to appoint judges and commute prison sentences. The King also sold off lucrative business interests as part of the announcement. In addition, the King announced that there would be parliamentary reform and elections in 2010. Fielakepa, the spokesman for the royal palace, said, "The Sovereign of the only Polynesian kingdom ... is voluntarily surrendering his powers to meet the democratic aspirations of many of his people ... [The people] favour a more representative, elected Parliament. The king agrees with them." In July 2010 the government published a new electoral roll and called Tonga's 101,900 citizens to add their names to the document so that they can take part in the historic vote, which was due to be held on 25 November. He would remain head of state, but lose his executive powers, including the ability to appoint the prime minister and ministers. However, it seemed certain that the Monarch would continue to appoint and administer the Judiciary of Tonga for the purposes of assuring that political independence and neutrality were retained. On 24 February 2012, he visited pope Benedict XVI into Vatican City. 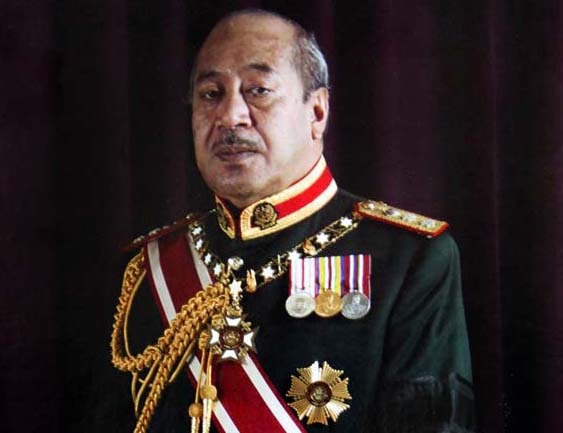 During his reign, George Tupou V oversaw reforms within the Tongan honours system which both expanded the number of Orders in the Kingdom and created rules to make the award of these Orders more egalitarian. The casket of King George Tupou V being carried to the Tombs. In September 2011, Tupou V had surgery to remove a kidney following the discovery of a tumour. On 15 September 2011 he received the Grand Cross of the Order of Merit of the Republic of Hungary from Pál Schmitt, the president of Hungary. In February 2012 the King received the Knight Grand Cross of the Royal Order of Francis I from Prince Carlo, Duke of Castro. During his time as Minister of Foreign Affairs, he had been made an officer of France's Legion of Honour. Matangi Tonga reported that George Tupou V died from leukemia at 15:15 HKT on 18 March 2012 at Queen Mary Hospital in Pok Fu Lam, Hong Kong, though governing institutions in Tonga did not immediately confirm it. His brother and heir presumptive Tupouto'a Lavaka was at the hospital when he died. A statement was due following a cabinet meeting the day after his death. Radio Australia reported that Tonga's largest religious organisation, the Free Wesleyan Church, said it would hold a prayer service at the queen mother's residence in Nuku'alofa. Prime Minister Lord Tu'ivakano later made a national address calling on the people of Tonga to pray for the royal family and the country, according to Radio New Zealand. Queen Elizabeth II sent a message of condolence saying that King Tupou was "a true statesman who served his country with distinction". King Harald V sent a message of condolence to King Tupou VI, in which he expresses sympathy for the new King, his family and the people of Tonga. 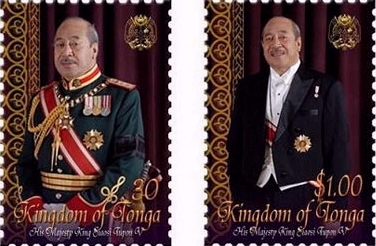 Australian Prime Minister Julia Gillard said that King Tupou's death was the loss of "a great friend" to Australia and pointed to the change he led Tonga through as the "first truly democratic elections, held in November 2010, set the country on a new course." New Zealand Prime Minister John Key said: "He believed that the monarchy was an instrument of change and can truly be seen as the architect of evolving democracy in Tonga. This will be his enduring legacy." Maori King Tuheitia said: "He kura i tangihia, he maimai aroha" which means condolences to the Royal Family and the people of Tonga. United States President Barack Obama said that King Tupou's death was the loss of "a friend" to the United States and the loss of "a visionary leader" to the people of Tonga. Following the official announcement of the passing of King George Tupou V and giving the Proclamation of the New King, Tupou VI, His Majesty's Cabinet set up a Committee for the organization of the state funeral of the King. Lord Vaea became the Chairman of the Committee. The King's body arrived on 26 March 2012, then lay in state at the Royal Palace in Nuku'alofa for a day. The funeral, originally announced for 28 March 2012, was rescheduled to 27 March 2012. Selected foreign dignitaries were invited by the Committee to attend the funeral, including the Governor General of Australia, Quentin Bryce, and the Governor-General of New Zealand, Jerry Mateparae. Royal guests at the ceremony included Prince Richard, Duke of Gloucester and Prince Hitachi of Japan and his wife, Princess Hitachi. ↑ Tongan Government Gazette Publication 20 and Gazette Publication 19 It might be argued that he became King on his swearing in (11 September, midday), or on the death of his father the night before. However, although the death of his father occurred on 10 September at 23:34 in New Zealand, Siaosi was in Tonga, where the time was 0:34, 11 September. This page was last modified on 7 January 2016, at 22:29.